After a relatively sloppy first half that supplied Providence with a narrow 1-point advantage going into halftime, Ed Cooley reignited the usual second half fire in this team that Friar fans have become accustomed to this year to ultimately give PC their 4th straight victory over a competitive UMass team at the Dunk this afternoon. The Friars, and more specifically Rodney Bullock, pushed their lead all the way up to 16 points in the second half but stuttered down the stretch, giving the Minutemen a glimmer of hope, pulling to within three down the stretch but never fully closing out the distance that the Friars put between the two teams. Bullock (26) and Emmitt Holt (18) provided the scoring and Kyron Cartwright dished out the assists (12) for a complete team win, improving the Friars home record to 7-0 and continuing their current hot streak during their home stand. Rodney Bullock lead all scorers with 26 points on 7-14 shooting from the floor. Bullock has some trouble finding his stroke in the first half, shooting only 2-8 from the floor for 8 points. Bullock came out with a fire in the second half, shooting 5-6 and dropping 18 of his 26 points, very similar to how he played in the Rhode Island game. This team needs Bullock to score for them to pull out wins against good teams and its a great sign that he doesn’t let a first half in which he doesn’t play his best into the second half. That really speaks to his character as a player. Bullock’s missed shots in the first half were ones that he usually makes, so it was just a matter of getting in a rhythm in order to get himself going. Bullock also grabbed a game-high 10 rebounds, marking his 2nd double-double of the year and 10th of his career. Bullock was able to get to the line often once again, finishing 10-12 (83%) from the charity stripe. He was just 14-22 (64%) combined over his previous three games after starting the season a ridiculous 27-30 (90%). He is now shooting a very solid 80% of the season thus far. Bullock has now been able to get double-digit free throw attempts in three of the last 4 games. One of the biggest strengths of Rodney’s offensive game is his ability to finish at the rim in some unorthodox ways. This finish following a Drew Edwards steal was impressive considering the angle and defender right on top of him. Although the steal and finish were both pretty nice, my favorite part was Kyron’s spin and look-away after his dish to Bullock. Speaking of Kyron Cartwright, although he wasn’t able to get some of his shots to fall in this one, he was able to get his teammates in great positions to get themselves some easy baskets. Cartwright tied his career-high of 12 assists that he set in the first game of the season against Vermont. Cartwright has no recorded 8 or more assists in 6 of the Friars 10 games this season. With the 12 assists, Cartwright is now averaging 7.7 assists per game. Even with baskets coming sparsely against UMass, Cartwright was able to cash in on this nifty double-clutch drive with the shot clock winding down in the second half. Emmitt Holt was tasked with the unenviable task of guarding the behemoth that is Rashaan Holloway from UMass in the post for the majority of the game. Holloway stands at 6’11” and 320 pounds (yeah right) compared to Holt’s 6’7” and 230 pound frame. Holt stood his ground for most of the game but when the Friars weren’t playing zone, Holt was at a major disadvantage down low. Holloway finished with 21 points and 9 rebounds but struggled from the line whenever the Friars put him to the task, going 7-13 on free throws. Holt was able to use his quickness against Holloway on the other end of the floor, basically matching him offensively (although in very different way) with 18 points on 6-12 shooting. After starting the season just 1-9 from three through the first 4 games, Holt has looked much more comfortable shooting from distance lately, going 6-11 over the last 5 games. The difference has to do with which three pointers he’s been taking lately. Instead of contested threes, Holt is taking threes from the corners where his defender is slacking off of him to account for his quickness off the dribble or he’s taking them in rhythm from a kick out coming from penetration. He’s been much better about attacking his defender off the dribble if he receives the ball at the top of the key and it’s really translated into more efficient outside shooting from Holt. Holt is now shooting a very respectable 35% from downtown. Of course, that doesn’t mean that Emmitt is a finesse player now. The dude can still finish through contact. Jalen Lindsey was limited in this game after picking up two quick fouls in a 16 second span with just 14:24 left in first half. With Lindsey being the Friars best individual defender, it hindered the team’s defense in the first half with him on the bench. It’s no coincidence that the Friars went on their big run at the start of the 2nd half. Their defensive stops are really what starts their offensive output, D transitioning to O.
I was really surprised at the increased playing time that Drew Edwards got this afternoon. Edwards basically took all of the Fazekas/Jackson combo’s minutes. Edwards played 19 minutes compared to 11 for Jackson and just 6 for Fazekas. I thought Cooley would go to Jackson more in this game, especially to help out on Holloway with some double-teams and help defensive once he got things going in the second half. Edwards logged just about twice as many minutes in this game than he has in any other game this season (besides the St. Francis game). Edwards did a little bit of everything, scoring 5 points, grabbing 3 rebounds, swiping 2 steals, and handing out 1 assist. We saw a little bit of the Freshman combo of guards with Diallo and White that Cooley seems to be trying to mix in whenever he gets a chance. Alpha Diallo used his length (and great posture) to secure 7 rebounds in just 11 minutes of game time. He really helped the rebounding for the team in this one, ultimately giving them the overall rebounding edge 40-38 in the game. I’m saying this every game and I’m going to keep on saying it every single time Kalif Young impresses me with his agility, but man that guy can really run the floor for a big man. This play ended up being spoiled by a travel call, but the hands, awareness, quickness, and nasty finishing ability were all on full display with this play. Not to be overshadowed is Kyron’s no-look pass that’s right on the money through a sea of defenders. For a team that doesn’t shot three pointers well, UMass certainly isn’t afraid to let them fly. They came into the game chucking 29 threes per contest and shot a crazy 33 of them in this one, going 10-33 (30.3%). Coming into the game, UMass was ranked 305th in the country in 3-point percentage at a 30.1% clip. Not sure why that doesn’t deter them from shooting so many, but it certainly helped the Friars win in this one, so I’m not going to be one to argue with their strategy. Freshman UMass guard Luwane Pipkins certainly has no qualms about pulling the trigger form anywhere on the floor. Pipkins (which is super fun to say) came into the game shooting a terrible 24.1% from three on 13-54 from downtown. That hasn’t stopped him from shooting almost 7 threes a game, which is an insane amount of attempts for someone who doesn’t seem to be very good at doing it. He was able to connect on 6-13 from three point range against Providence, so I wouldn’t expect him to stop chucking any time soon. This win will end up looking pretty nice on the PC resume at the end of the year as UMass currently has an RPI of 70 (for whatever that is worth). Cooley had some really nice things to say about the current state of this UMass squad. 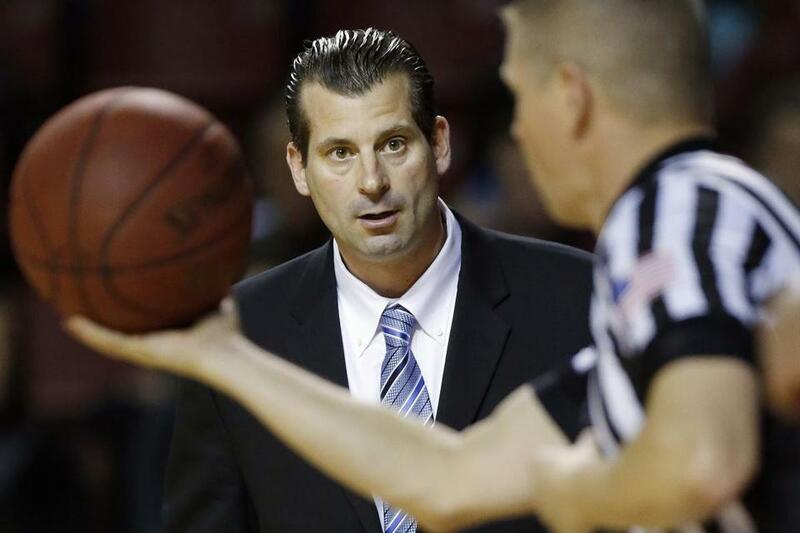 Did anyone else check out that hair from UMass coach Derek Kellogg? The Friars Defense was stellar once again, forcing the Minutemen into 19 turnovers as a team and holding them to 41.7% shooting from the floor. My favorite highlight of the game goes to this Kyron Cartwright find of Kalif Young all the way down the court. The reactions from Cartwright and Coach Kellogg were on complete opposite ends of the spectrum and summed up the play perfectly. 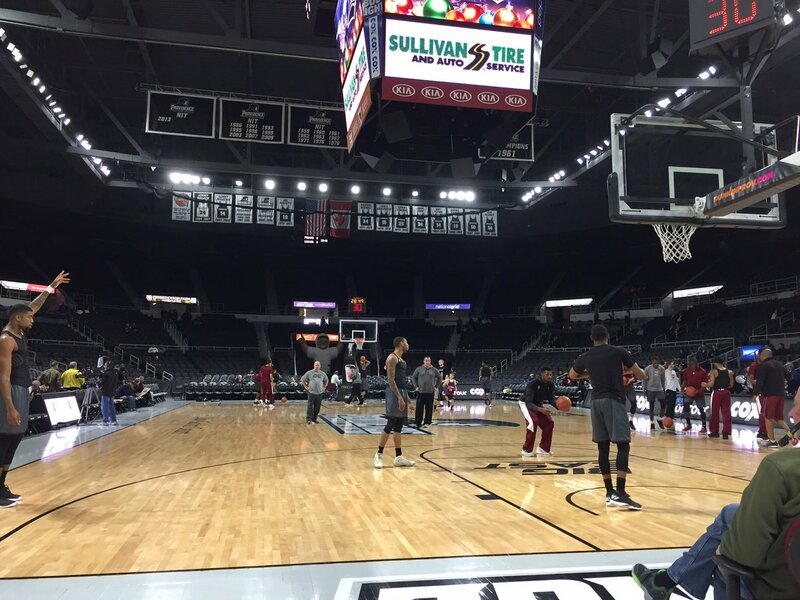 Up Next, the Friars take on Wagner for their 5th game of a 6-game homestand at The Dunk. The game is on Saturday at Noon and will be televised on FS1.